The Herbert Wertheim College of Medicine is expanding its relationship with Jackson Health System by launching a hospitalist program at Jackson Memorial Hospital. A group of FIU physicians who specialize in internal medicine will start working as “hospitalists”, taking care of hospitalized patients at JMH, the largest of Jackson’s countywide system of hospitals and clinics. FIU doctors have been practicing at Jackson North Medical Center in Miami Beach since 2007, but not as hospitalists. Hospitalists treat patients exclusively in a hospital setting, in place of a primary care physician. As part of the new hospitalist program, HWCOM fourth year students will also be doing clinical rotations at JMH. “This allows us to enhance our students’ educational experience while helping to improve the quality of care available to our community,” said Dr. John A. Rock, HWCOM founding dean and senior vice president for health affairs. The FIU docs who will be working at Jackson as hospitalists are: Aileen Andreu, M.D. ; Jose Martinez-Alejade, MD; Frank Lefevre, M.D. ; and Muhammad Adnan Aziz, M.D. Under the agreement announced Wednesday, Oct. 23, the Public Health Trust which runs Jackson will pay FIU $1.2 million/year for hospitalist services. 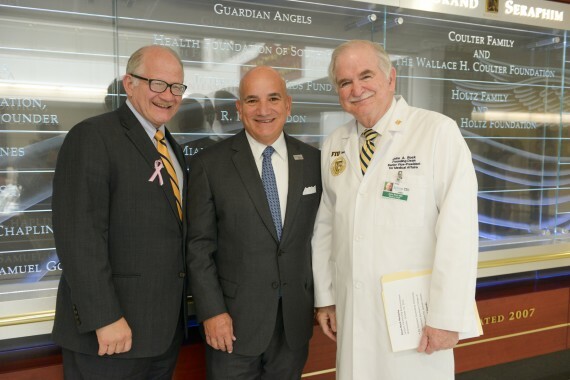 “Jackson has a long-standing reputation as a premiere academic medical center and our evolving partnership with FIU will only make us stronger,”said Carlos A. Migoya, president and CEO of Jackson Health System.